A few days ago I published an article by Rachel Stinson titled “6 reasons why Leica is better than Nikon and Canon.” I explained that this were the opinions of the author and thus quite subjective. I also mentioned that it would be very helpful if Leica were to publish some tangible figures of what they do to set themselves apart from their competitors. Obviously Nikon and Canon are very capable companies, as are many others. It is certainly not the case that Leica somehow has some knowledge that their competitors do not have. Nobody is able to perform any miracles either. Yet especially Leica lenses are generally considered to be the best on the market. So what is it that allows Leica to set themselves apart? The simple answer is ‘tolerances’. That is especially the case with lenses. Unfortunately it is impossible to make a perfect lens, one without any flaws. To minimize these shortcomings a manufacturer has to try to come as close to the ideal as possible. That can only be done by using tolerances a tight as possible. Any lens consists of a variety of individual lens elements to control aberrations. The tighter the tolerances are controlled during the manufacture, the better the resulting lens will be. This starts with the design of the lens and the selection of optical glasses needed for the manufacture. Any lens is made up of lens elements made from glasses of various refracting indices and various levels of dispersions. Leica has very high demands in this respect. 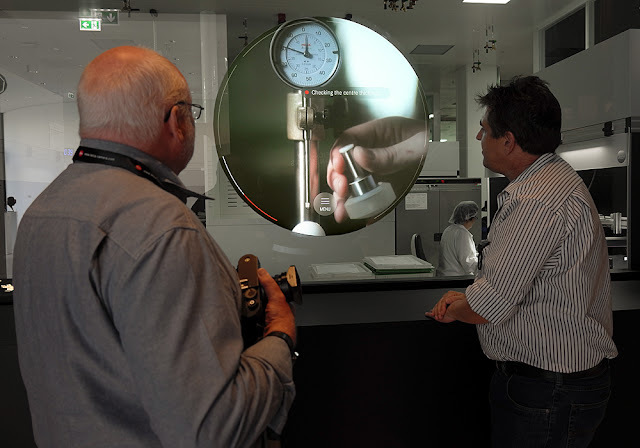 Leica applies a standard of ±0.0002% for the accuracy of the refractive index. This compares to the international standard of ±0.001% as applied by most other companies. The accuracy of the Abbe number, the measure for dispersion is ±0.2% for Leica compared to ±0.8% internationally. 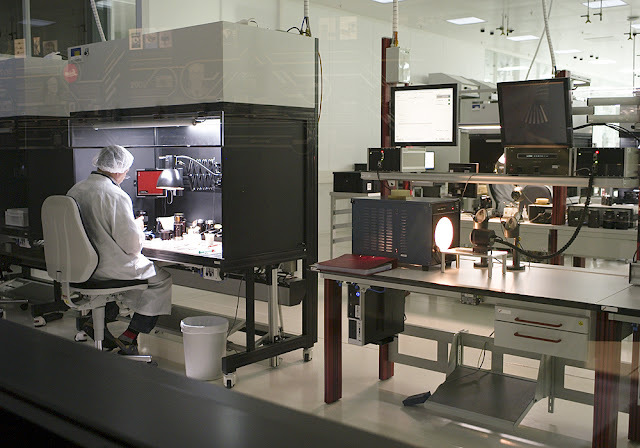 Then, during the manufacture of the individual lens elements, Leica allows production tolerance of no more than ¼ lambda or ¼ of the average wavelength of light which corresponds to approximately 500 nanometers or 0.0005mm for the accuracy of the lens surface. In comparison, the tolerances applied by other lens manufacturers are ½ lambda or 0.001mm. For the production of aspherical lens elements Leica applies even tighter tolerances which cannot exceed 0.03 micrometer or 0.00003mm. Virtually all manufacturers do mass produce their cameras and lenses with the exception of Leica. The extremely tight tolerances demanded by Leica simply cannot be achieved with mass production. 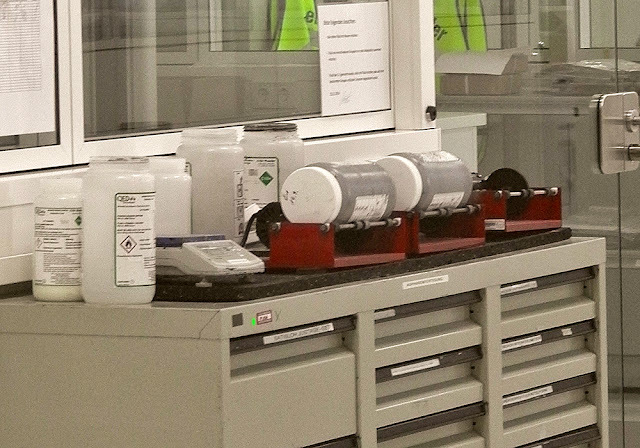 While computer controlled manufacturing processes have greatly improved accuracy, it requires a large amount of hand assembly with constant checks and rechecks to achieve the tolerance levels as applied by Leica. However, these tight optical tolerances are meaningless if not accompanied by equally tight mechanical tolerance. The industry average standard is 1/1000 of an inch, with a few manufacturers like Canon and Nikon going to 1/1250 or even 1/1500 of an inch. Leica cameras on the other hand continue to be made to tolerances of 1/2500 of an inch or more precisely 1/100 of a millimeter. These mechanical tolerances are applied throughout their lenses as well as with their cameras. For instance, each lens mount has to stay within these tolerances in its distance to the sensor. Anything less will adversely affect the performance of their lenses. It was recognized that the resolution of a lens is limited in part due to a lack of correction of secondary colors. Based on the light refracting properties of available optical glasses, most lenses can only bring two wavelengths to a common focus. The optical designer must choose these wavelengths to best suit the intended use of the lens. All other wavelengths are then focused in planes predetermined by the properties of the glasses over which the designer has no control. Such lenses are generally referred to as achromats and are corrected for wavelengths from 400 to no more than 600 nanometers. Anything shorter is not taken into consideration. 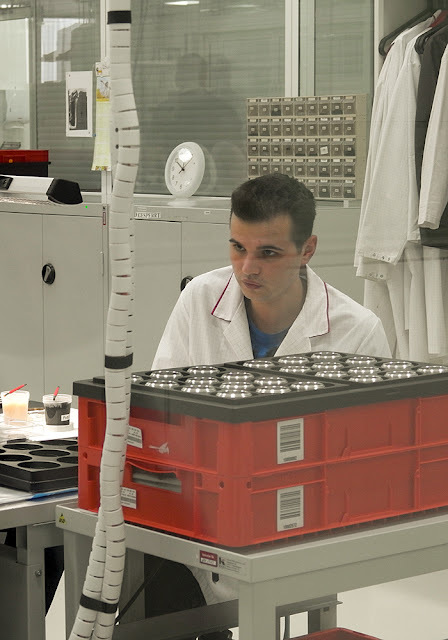 Leica makes a large amount of apochromatically corrected lenses, a lot of which are corrected from 400 to about 900 nanometers. The first example of such a lens was the 180mm f/3.4 Apo Telyt R which initially was made for the US Navy and which was a classified piece of equipment for several years. Many of these lenses permit photography in black and white, color and infrared with the same focal setting. The advantage of such lenses lies in the fact that they have an extremely small focus shift between the blue and red colors of the spectrum. In simple terms, it makes them a lot sharper, meaning a noticeably higher resolution. The Apo Telyt has maximum focal plane shift of 0.08mm or ±0.04mm which is less than 1/2000 of an inch. This is one of the very reasons why the tight mechanical tolerances, as applied by Leica, are necessary. If not, the camera would be unable to take advantage of the optical capabilities of the lens. For comparison, with a conventional lens, the maximum focal plane shift is 0.2mm as compared to 0.08mm for the 180mm f/3.4 lens. This amounts to a factor of 2.5 over the 180mm f/3.4 lens. As of late many manufacturers are offering lenses with aspherical surfaces which can greatly improve lens performance by virtually eliminating spherical aberration. However, there are two distinctively different approaches in the manufacture of these elements. An inexpensive method is to produce a “conventional” spherical element and sandwich it with a thin aspherical surface element. These are made of precision molded acrylic. However, this method, originally developed by Zeiss, was ultimately discarded by them because it could not approach their quality standards. The main cause was the fact that even the clearest plastics, like acrylics, consist of very large molecules. Light, when transmitting, literally will scatter off these molecules, causing the light to be slightly diffused, which ultimately has adverse effects on lens performance. Other companies use precision molding equipment where a glass blank is reheated until it becomes pliable and then is precision molded into the final shape of the lens element. Some exotic types of glasses cannot be used with this method because the reheating and molding will cause the glass to deteriorate and thus make it useless. Subsequently, this precision molding process forces the lens designer to compromise to a certain degree because better suited glasses cannot be utilized. The same applies to lens elements of larger diameters. Leica uses an entirely different approach. 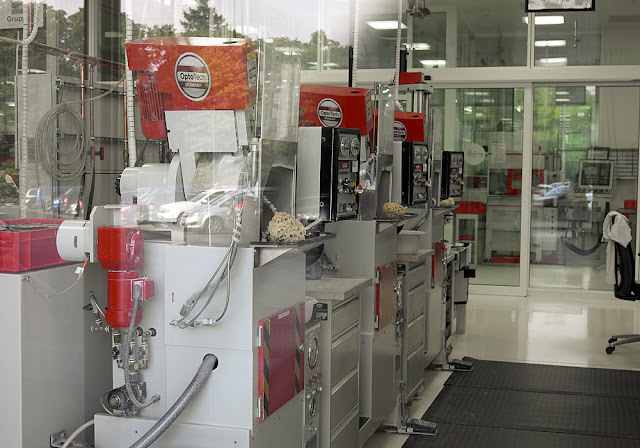 They use computer controlled automatic grinding and polishing of the glass elements which require the adherence to extremely tight tolerances. Unfortunately such production methods can only be achieved at considerable expense. As already mentioned for the production of aspherical lens elements Leica applies tolerances which cannot exceed 0.03 micrometer or 0.00003mm. To achieve such precision Leica employs special grinding machines where the lens element is rotating against the grinding head, which is in form of a narrow rod. This will grind only a small section of the entire surface of the lens element at a time. A special grinding substance is also used which is partially magnetized. This is done to allow for a more precise adherence of the grinding substance to the lens and grinding rod surface. With all lens elements the grinding substance becomes ever finer from one step to the next until it is mostly water with a small amount of a very fine polishing compound. 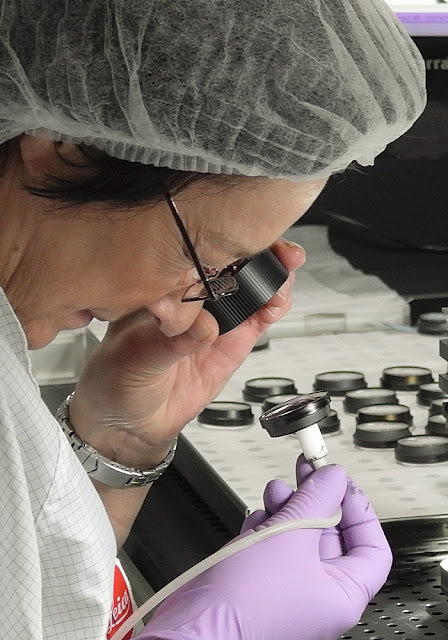 Unlike with other manufacturers, at Leica all individual lens elements, spherical and aspherical, do not approach their final surface configuration and thickness until the lens coating is applied. 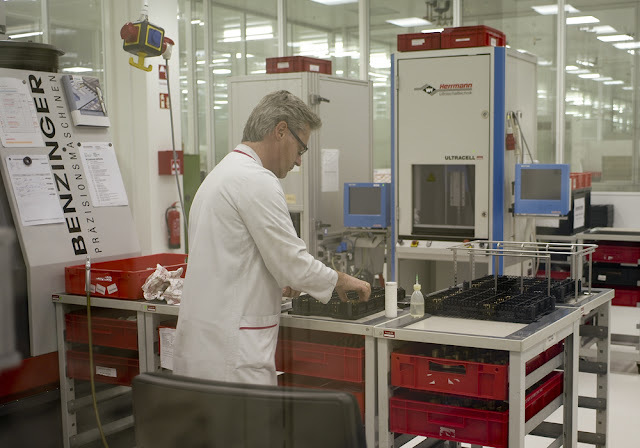 Lens coating at Leica is not applied in the same manner for all elements. Instead selective coating layers of different substances is applied in a manner that eliminates surface reflection as much as possible. 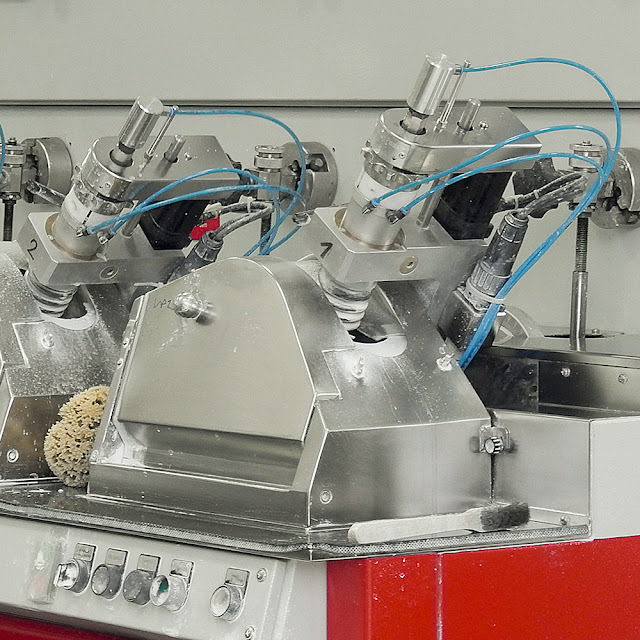 Grinding aspherical surfaces via the method used at Leica is extremely time consuming. 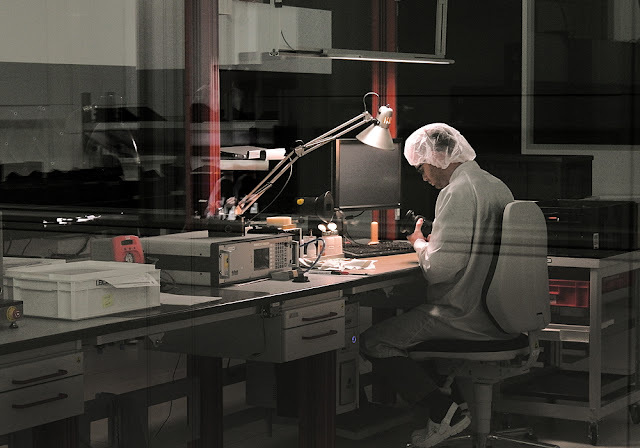 As with all manufacturing steps at Leica, each individual step is immediately followed by a check. If these checks show that deviations from the norm still exist, the step is either followed by additional work, or the lens element is discarded. This often leads to no more than five aspherical lens elements being produced in a single day. To increase lens production, Leica tried to outsource the manufacture of some aspherical lens elements to other companies. The companies that were approached by Leica either were not able to work within the specified tolerances or they simply were not able to supply a sufficient number of elements to make such cooperation feasible. 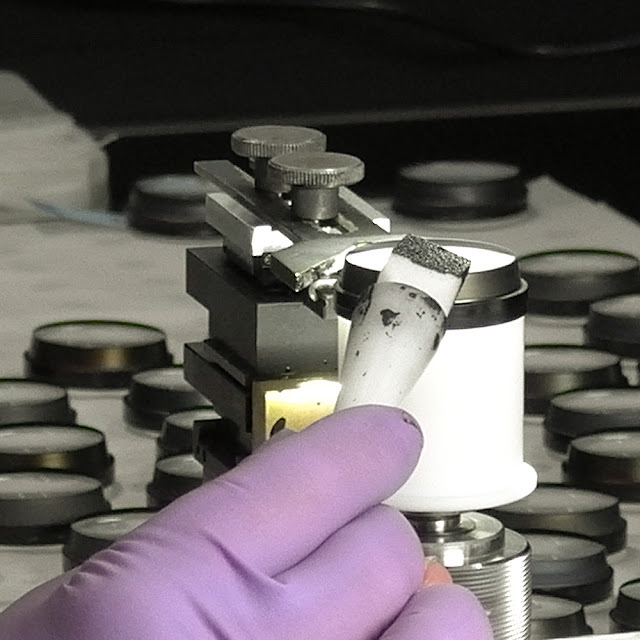 Before lenses are assembled, each lens element is coated at the sides with black paint to avoid reflections. This used to be done with a brush, but now a specially designed foam applicator is used instead. The question is often asked why this isn't done by machine. The simple answer is higher accuracy. The general black coating is easily applied with just one step. However the often sharp edge between the polished lens surface and the edge often requires as many of five additional applications to be perfect. This can only be done by hand. All of this makes Leica by far the foremost and most advanced manufacturer of aspherical lens elements in the world. 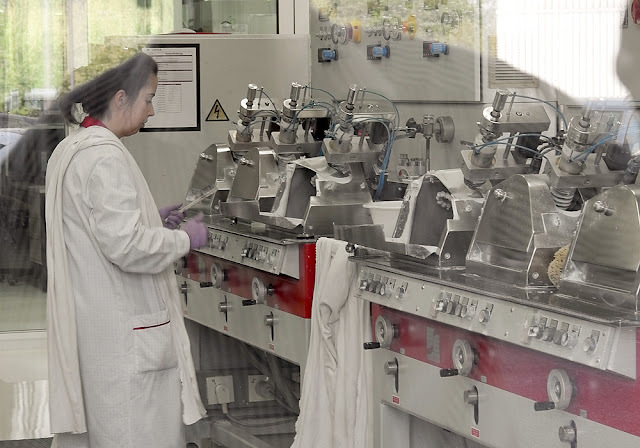 There are a couple of additional steps in the manufacture of Leica lenses which are virtually ignored by other manufacturers. It is a known fact that regardless of how precise one tries to make each individual lens, there will always be slight fluctuations in performance from one lens to another. To minimize these fluctuations, Leica tests each individual lens element after the completion of all manufacturing steps to determine its actual focal length and along with it the fluctuations from the ideal. If these do not fall within the rather stringent parameters set by Leica, these elements are usually discarded. The other ones are described with plus or minus figures to indicate the deviations. 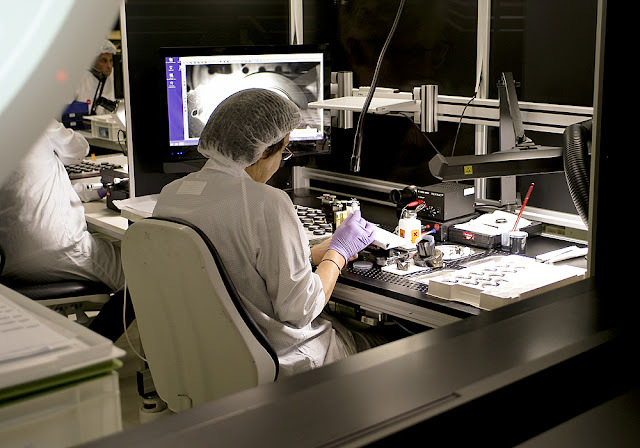 Then, during assembly of the optical components, these figures are used to even out the differences with the result that there are considerably less fluctuation in performance from one lens to another. Finally, there are some additional steps when it comes to the Leica rangefinder lenses. In order to work with utmost focusing accuracy in conjunction with the mechanical Leica rangefinder, the actual focal length of each lens is measured very accurately. Older Leica lenses were even engraved with these figures. For instance, my 90mm f/2.8 Elmarit has the figure 05 engraved to the right of the infinity mark on the focusing scale while my 135mm f/2.8 Elmarit reads 55. If my memory serves me correctly, this means that the 90mm is actually a 89.5mm lens while the 135mm in reality is a 135.5mm lens. The focusing cam of all Leica rangefinder lenses is then ground by hand to reflect the actual focal length of the lens to make rangefinder focusing as accurate as possible. Unfortunately all of this is also quite expensive. But it proves once again, you get what you pay for. Heinz, there are six reasons, there is only one reason. Leica is Leica! Are you seriously suggesting that Nikon and Canon are incapable to make lenses like Leica? Not at all, of course they could. But with the production methods (mass production) they have chosen for themselves, it is impossible to do so. Wouldn't Leica be better off to select a lower cost labor market to manufacture their goods? Wouldn't that make them more competitive? No. Even now Leica is being severely criticized for having a manufacturing plant in Portugal. Especially non-Leica owners seem to be hung up on the 'made in Germany' label, conveniently forgetting that a lot of the Nikon or canon equipment they use is made in countries other than Japan. The same thing happened when Leica had their manufacturing facility in Midland, Ontario. What many didn't realize that for a while, the majority of Leica lenses were designed at the Midland plant after their chief lens designer started working there. I don't think it really matters. We Germans don't have some mystical extra capability to make things. In the end it is the standards a company sets, where those standards are being adhered to is ultimately of no consequence. The lens in the photo is not an 180 / 3.4 but an Apo-Telyt 3.4 /135 mm. 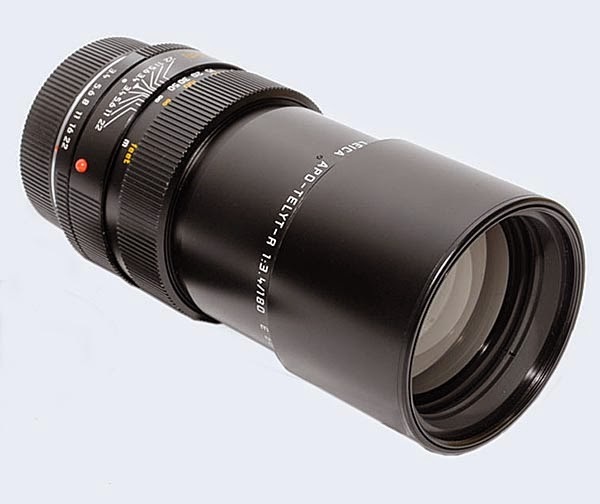 The only 180mm lens in the M system is the Tele-Elmarit 2.8/180mm of the Visoflex System. You are mistaken. The labeling of the lens in the photograph clearly reads "Leica Apo Telyt R 1:3.4 180" The R designation means that it is a lens for the former Leica reflex cameras. Not everything Leica made was for the M system. Great read...but with all this precision techniques put into production of these beauties, one is left with ‘substandard’ operation based on a vague approximation of human eye/fingers (when focusing) under the pressure of the moment to be captured. Meaning - the human factor fails this process or am I wrong? I’m yet to find a Leica shot that is sharper than average.. it almost seems that it all works in laboratory, not really in the field. In fact, most iconic Leica shots out there are not sharp at all. Beauty of photography, I guess. Please correct me if I’m wrong. We must separate results that are influenced by the situation of the moment from the times when everything can and is done correctly. Leicas are the premier instrument for street photography. Unfortunately the "nature of the beast" is such that not everything can be done in such situations as correctly as it should. subject movement, possible lack of depth of field are just a few of those influences. The other side of the coin are images that are taken when deliberate, accurate focusing and all else can be done correctly. In those situations, including using the best aperture setting on the lens, a Leica can and will deliver results that rival those of larger format cameras. Heinz Richter impressive, indeed. But then again - one would question if, given the fact it’s meant for such ‘imprecise’ use, it’s appropriate to create such gems when not used to the potential...? For precise architectural shots I use P1/IQ3 100mp, but Leica is for the ‘decisive moment’ photography. Rarely (if!) sharp as above. Sounds like an overkill. Don’t get me wrong, I love ‘Leica look’ (especially film) but sharpness in Leica was never my main concern, yet it clearly (unnecessarily?) drives the price. I can't disagree with what you say. However, even though Leicas are imminently suited for 'the decisive moment' photography, this is by far not the only reason people chose the Leica over other cameras, and we must also consider that the Leica M system is far from being the only Leica system available. We cannot expect Leica to sacrifice overall quality and potential performance of any of their cameras just because they are often used in situations where the full potential often cannot be met. Heinz Richter point taken. I was, of course, referring to the M system, not any other where such precision could be justified much easier. Interesting conversation though, thank you. A friend who shot only Nikon would by five or six of the same lens whenever he purchased a new one. He then shot with all the lenses and compared images. He would choose the best and and return the rest. The reason being that fluctuations in performance from one lens to the next are substantially higher than is the case with Leica lenses. Even if I already knew about it, it is always impressive to read how Leica makes their lenses, and what sets them apart from the rest. I am really proud to be Ambassador of such tradition, craftsmanship and constant aim to perfection!